DELICATO: Harvested from hand-picked, organically-grown olives from the Quattrociocchi estate in Lazio, this wonderfully harmonious extra virgin olive oil is cold-extracted exclusively from Leccino olives. Its aroma is elegant with notes of artichoke and wild chicory, enriched with aromatic notes of basil and mint. The flavor is delicate and captivating with lettuce, black pepper and sweet almond. This oil is ideal for drizzling over antipasti, salmon carpaccio, artichoke risotto, grilled fish, vegetable soups, shellfish pastas, boiled fish, soft cheeses and biscotti. CLASSICO: Produced exclusively from organic olives grown on the Quattrociocchi Estate, this extra virgin olive oil is medium-intense in fruitiness with a powerful and strong aroma, characterized by vegetal notes, green grass, mint and rosemary. Its taste is fine and balanced with a flavor of garden vegetables and dried fruit with a strong, pungent finish. 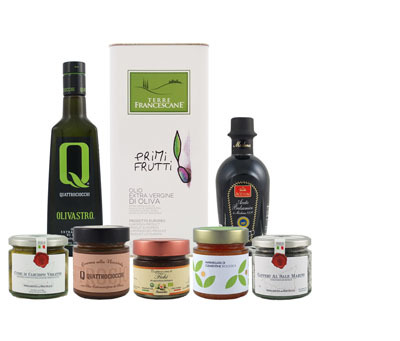 OLIVASTRO: This extra virgin olive oil is produced exclusively from 100% Itrana variety olives locally grown on the Quattrociocchi Estate in Alatri. This oil has a fruity aroma enhanced by complex notes of grass, artichoke, green tomato and apple. Its flavor is pleasantly balanced in bitter and spiciness with hints of green almond. SUPERBO: Not for the faint of heart, this amazing organic extra virgin olive oil is powerful and pungent. Produced exclusively from organic Moraiolo variety olives, this oil is intense in fruitiness with complex notes of fresh-cut grass and artichoke with definite aromatic hints of mint, sage and basil. Its taste is strong, bitter and pungent and well-balanced throughout, an oil for the true connoisseur.